The hall comprises an open plan layout of 10m x 7.5m, which has wooden block flooring. It is licensed for a capacity of 60 people and is suitable for small to medium sized meetings and events, training days, family celebrations and weekly classes. The hall has modern full size folding tables and chairs available and can be configured in a number of arrangements to match your requirements. The hall was refurbished in 2013 to ensure it meets the stringent current electrical, fire and safety regulations for a public building. It has also undergone redecoration to give a warm and welcoming atmosphere to your guests and customers. 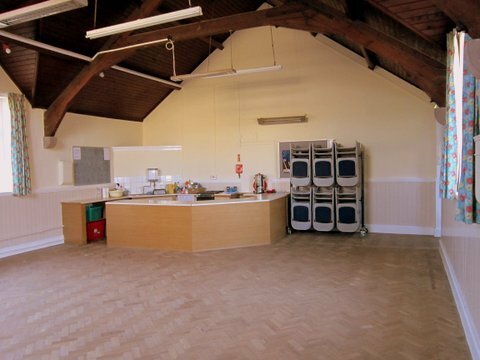 We have a kitchen area which is available for the provision of light meals, snacks and refreshments. It is fitted with a cooker, fridge and tea urn together with crockery and cutlery. Hire charge remains at a highly competitive £7.50 per hour, fully inclusive of lighting and heating with discounts for half day and full day hire. We are more than happy for you to view the hall at any time. For more information or to enquire about booking, please contact us.